A burger is often just a burger, yet if you take the time and energy to make it special, then it becomes a sought-after meal to be repeated time and time again. That’s what we are after here, something unique, memorable and maybe even unrepeatable – after all, we aren’t really expecting to make a fast food standard out of our nourishing homestyle Paleo cooking. Good food is all about the quality of ingredients, the willingness to try new things, and repeatability with subtly distinct differences. If you have been stuck on the idea that beef burgers are the best, now is your chance to challenge that belief. Here we are using ground lamb, a high-quality protein, with an added health bonus that most lambs are grass-fed. So with a different kind of red meat you are getting better quality fats, vitamin K2 and beneficial antioxidants. You can feel good about supporting a cleaner way of rearing animals, and absorb all of the essential nutrients too. Not to mention the flavor. It may not be what you are used to, yet chances are pretty good that you’ll love it – with or without the avocado sauce. For that imperative sauce, you will want to make your own homemade mayonnaise. An avocado is simply an avocado without it. Combined they are a treasure to behold – and devour! Place all ingredients for the avocado sauce in a blender. Pulse until everything is smooth; refrigerate. In a bowl, combine all the ingredients for the lamb except the lettuce leaves, and mix until well blended. Form small patties with the lamb mixture and season to taste. Grill the patties 3 to 4 minutes per side, or until desired doneness. 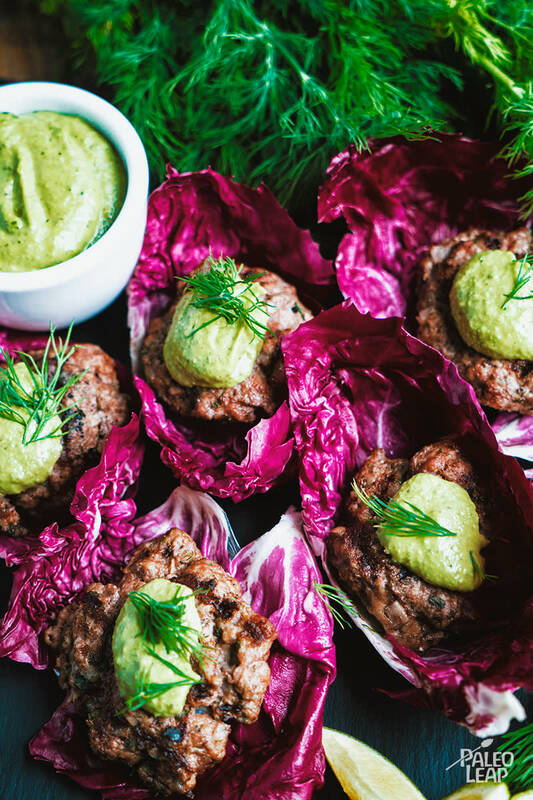 Serve the patties wrapped in radicchio leaves topped with avocado sauce.